Students and liberal activists across America joined together with dark money lobbyist groups and Harveywood celebrities on Saturday to demand the right to bear arms be scrapped to bring about utopia. As their teachers and the media have informed them, all violence in America is caused by guns. If we just ban guns, violence will go away. It's pretty simple, really. What's shocking is how these stupid adults just don't understand! Hundreds of thousands have turned out in Washington DC for the historic March for Our Lives protest against gun violence which has been heralded by the Parkland shooting survivors who organized it as the 'of a revolution'. The event is being led by the student survivors of the Marjory Stoneman Douglas High School shooting on February 14 when 17 were slaughtered by a teenage gunman carrying a legally-purchased AR-15. Some 800 other events are being held around the world in solidarity, but it is the DC march students hope will finally force congress to change gun laws. The DC march began at noon on Pennsylvania Avenue between 3rd street and 12th street NW but large crowds had already formed by 8.30am. Among celebrity attendees in Washington DC is George Clooney who posed for a photograph with Dennis Rodman before the event kicked off. Jimmy Fallon, Miley Cyrus, Steven Spielberg and Ariana Grande is also there and Oprah Winfrey is expected to attend. We've created a generation of kids whose only goal in life is to achieve social media fame. They'll do whatever the hell the media tells them if it means Twitter followers and Facebook likes. 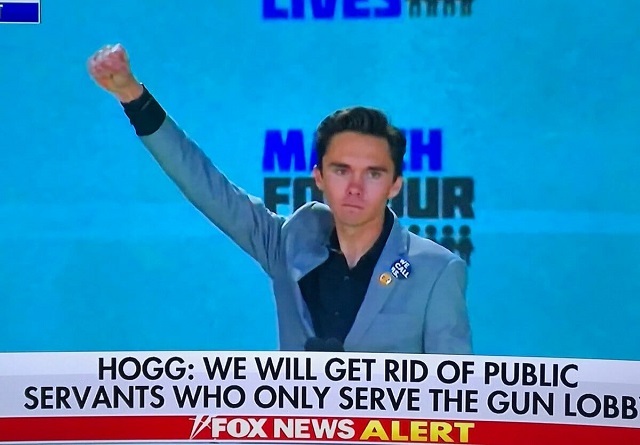 Why don't you march on the Broward County Sheriff's Office to ask why they ignored hundreds of warnings about Nikolas Cruz and stood down during the Parkland shooting? That's why so many kids died. The police could have taken his gun away legally and prevented him from getting it in the first place had they actually done their jobs. St. Mary's County Sheriff's Office deputy Blaine Gaskill stopped a school shooting in Maryland earlier this week in seconds. You're marching to disarm the citizenry so mass shooters like Nikolas Cruz can have open reign to kill anyone they want without us being able to fight back as coward cops like Scot Peterson let us all die to collect their pensions. Disarming law-abiding Americans because criminals committed crimes with guns is going to cause more violence in society, not less.